A must-have, no matter the season. The single largest footwear trend in recent memory is undoubtedly the white leather sneaker; seemingly every brand has released their own version of this shoe. New models are announced daily, and to many people, they all look exactly the same. To be perfectly fair, this is often a valid problem – rather than innovating and pioneering new styles, many brands pounce on upcoming trends and copy them exactly. Some of them do so under the guise of fast fashion, others by creating “high quality alternatives”. Either way, they both produce visually identical products, so the market is visibly saturated with clones of a single type of shoe. This is not necessarily a bad thing: popular trends have always operated in this manner, and the garments are only produced in this way due to exceedingly high demand. 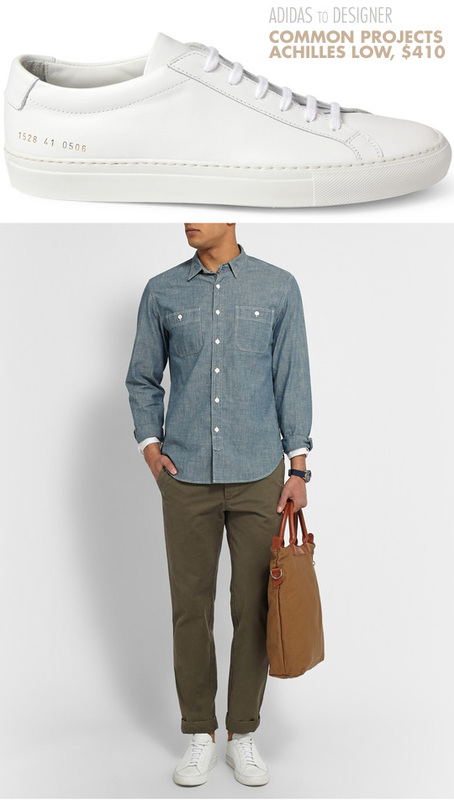 For the past few years, menswear as a whole has been enamored by monochromatic color schemes. This is also not particularly new – modern monochrome fashion trends can be traced back all the way to the 1920’s. This is to be expected, given the fundamental cyclicality of fashion. We have entered another decade of minimalism, and white sneakers are an easy way to break into the prevailing vogue. One major reason why white sneakers have become so popular is our current fixation on silhouette. Without other colors to break up the image of the shoe, its shape takes center stage, which allows for a great deal of experimentation. Black shoes offer this same advantage, but with much less contrast (which can be a good or bad thing). Furthermore, white is an incredibly versatile color – you can wear it in combination with any color you could imagine. If you only own a few pairs of shoes, this adaptability could double the number of possible outfits in your closet. White sneakers can be traced back nearly a century to the quintessential Converse Chuck Taylor, which has maintained its popularity to this day. Keds had already been making sneakers for nearly three decades when Converse released their first model, but they never received celebrity endorsements or media support. After Converse, dozens of other brands began making their own sneakers, and that number has since grown into the thousands. 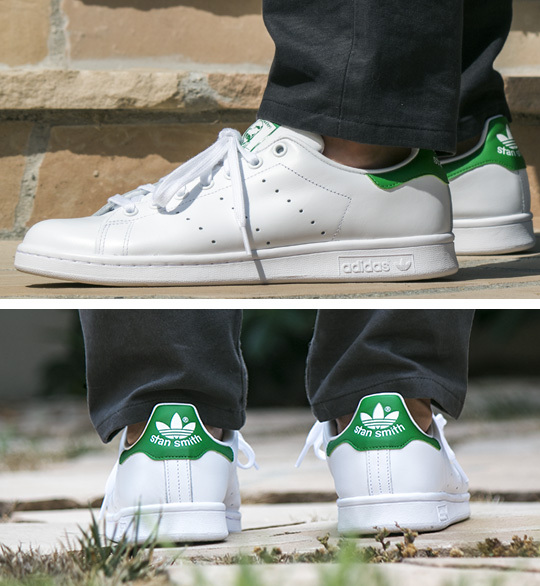 The most direct influence on the white leather sneaker we see today is most certainly Adidas; from the Stan Smith shown above to the Rod Laver, their innovative designs have been a mainstay in contemporary footwear since day one. While Adidas may be the patriarchal figure in modern-day sneaker culture, many other brands have since entered the fray. Most notably, Common Projects (established in 2004) is almost single-handedly responsible for the recent influx of minimally branded white sneakers. Their flagship model, the Achilles Low, took a great deal of inspiration from vintage Adidas, but in a unique way. The silhouette and design was nearly identical to the classic, but all branding had been stripped away, save for a small gold identification number on the side of the shoe. Ten years ago, these shoes retailed for around $200, but their prices have since doubled due to their huge rise in popularity. 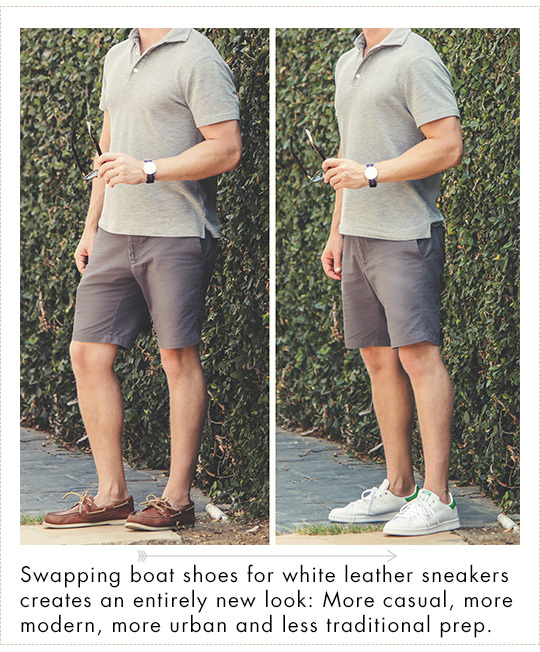 As a result, the Achilles Low has become somewhat of a status symbol, so it might not be the best choice for someone looking to dip their toes in the trend. As Common Projects grew, Adidas truly skyrocketed – they’ve always been a major sneaker brand, but they haven’t been this important in decades. Collaborations with designers (Yohji Yamamoto, Raf Simons, Kanye West, etc. ), limited releases, and celebrity endorsements have brought them up to the forefront of men’s fashion, and their prices have remained low enough that they are still accessible to those on a budget. As such, Stan Smiths (and their derivative works) are an excellent choice for those seeking a cheap entry into the realm of white sneakers. Although Adidas and Common Projects might be the most popular brands in the white sneaker market, you should still consider their competition. The Killshots and Purcell’s are the way to go. Got both of them in my lineup. The Nike Killshot 2 doesn’t seem to belong in this group of shoes, with the colored swoosh and the sole. The Air Force 1s were a big style choice when I was younger but they’re too bulky for the styles featured here. I think all white Nike Dunk Lows would fit the bill much better. I just picked up a pair of white Converse, and I have to say, I love how they seem to work with everything. It also helps that they’re much lighter than my old work sneakers, and look a hell of a lot better too. Nice! Glad you like ’em! I have a pair of the white “leather” converse and I’m frankly disappointed. I live in the city, so I wear my shoes pretty hard the “leather” is peeling off in some spots and I had to super glue the sole after only a couple months of sparing use. Vans Old Skool Premium Leather pack are available at 6pm.com for only $45 w/ many 10% Discount codes available. Purchased white and black for myself, and really go with anything. I find the white sneaker fad interesting, because they never really disappeared for long. They began losing some appeal in the 90’s, because 1) there were now more other colors to choose from and 2) they’d been a staple for so long that people grew tired of them (i.e. they looked dated). Even so, they were still always considered stylish until the white sneaker backlash a few years ago and now they’re treated as if they’re something new, which I just find odd. Personally, I’d argue that they were much more popular in the past then they are today, but there was also much less competition. I’m skeptical about the claim of Adidas being more popular today, also, because Stan Smith’s have always been big and the Samba was huge in the 90’s, along with a lot of other Adidas gear. I think they’re just new to a younger generation.